At Båly in Spangereid, all the way down south in Norway, a unique structure is taking shape. Although there are other places where you can enjoy food underwater, they look more like aquariums compared to the restaurant Under. Offering accommodation for up to 100 guests in an area of about 500 square meters (5,300 square feet), it is the world’s largest of its kind. Striking architecture, beautiful interior and food expected to be on the highest level has made Under an international sensation well before opening. 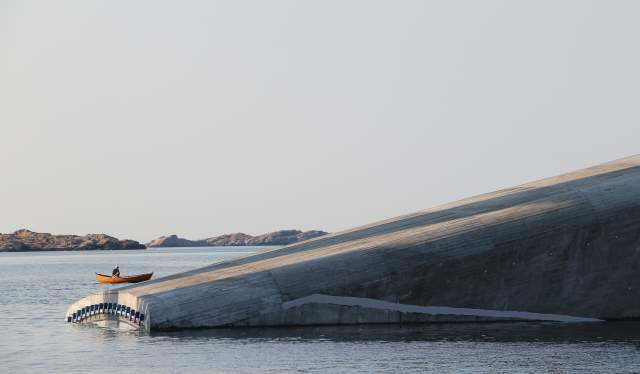 More than 4000 bookings had already been made as the lower part of the was placed at the bottom of the Skagerrak sea in July. Under is – like several other spectacular buildings – designed by the Norwegian architect office Snøhetta. Rune Grasdal, project manager at Snøhetta, explains that the most time-consuming part of the work process has been removing everything that isn’t essential to the concept. “We had to spend a lot of time making it simpler. The building’s function is taking people down to the sea bottom in a safe and simple way. It has to be able to withstand the forces of nature – water pressure, waves and rough weather”, he says to Visit Norway. Grasdal has been inside the restaurant after it was lowered into the sea this summer. Schools of fish have already gathered in the area surrounding the structure, and while there, the architect had the unusual pleasure of witnessing rain whip up the ocean surface – from below. “This will be a special experience regardless of the season and the weather. It’s obviously awesome being there in stormy weather, but also beautiful when the sunshine creates fantastic colour patterns in the surface. The experience will vary according to the time of day and year”, says Grasdal. 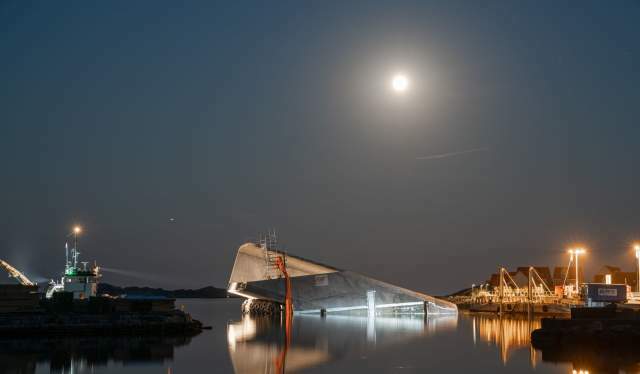 He reveals that Snøhetta is currently working on the lighting conditions, making sure that the view is unforgettable even as the ocean is pitch black. Inside the restaurant, the mood will be “safe, nice and warm”, according to Rune Grasdal, with local oak tree as one of the prominent features. Exactly which dishes will be served is still a secret, but the kitchen’s mastermind, Danish chef Nicolai Ellitsgaard, promises to base Under’s menu on the rich nature in the Lindesnes area. Obviously, this means a plethora of fish and seafood, but also local birds, wild sheep, mushrooms and berries. “My team and I work in close cooperation with local farmers, fishermen, hunters and harvesters to provide the freshest ingredients. In this way, we create flavorful, innovative dishes that reflect our landscape”. 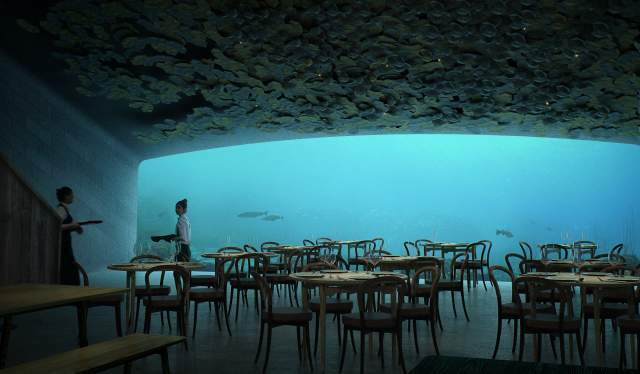 The underwater restaurant, Under, will be worth the trip in and of itself. However, you can experience a lot of other things in the Lindesnes region. Vigeland, the municipal centre of Lindesnes, is a 15-minute drive from Mandal. From there, the road leads to Spangereid where sights include the famous Spangereid Canal. The team behind Under would like to make it as convenient as possible for guests who are coming from afar to experience Under. It is a comfortable walking distance from the restaurant to first-rate accommodation at Lindesnes Sea Hotel. If you stay on Spangereidveien Road until it ends, you will come to another major tourist attraction in Southern Norway. 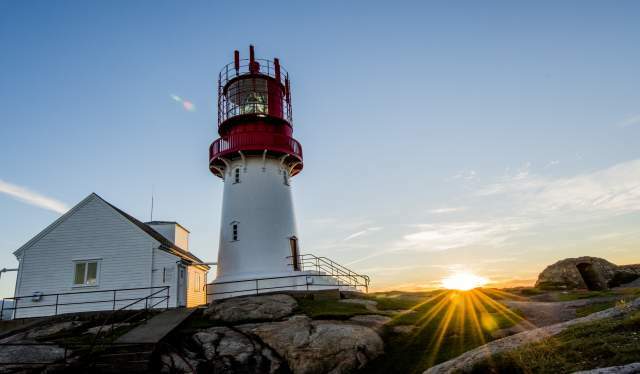 Lindesnes Lighthouse is Norway's oldest, and it can be an excellent place for those of you who like stormy conditions. Some Norwegian food traditions may look strange and sound crazy, but the taste of national treasures such as smalahove, lutefisk and aquavit is as unique as it is delicious.